The lily is gorgeously dark; I can see it has red pollen instead of the usual yellow; I don’t think I’ve ever see that before, amazing. The composition is lovely too really showing off the beauty of the lily. I’m infatuated with this lily. It’s growing in a container. Now in its third year there are a lot of blooms. I’m not a big fan of red and yellow together, so that red pollen is such a good trait. Thanks. I’m really happy to have this rich red color and I agree, the dark pollen is nice. 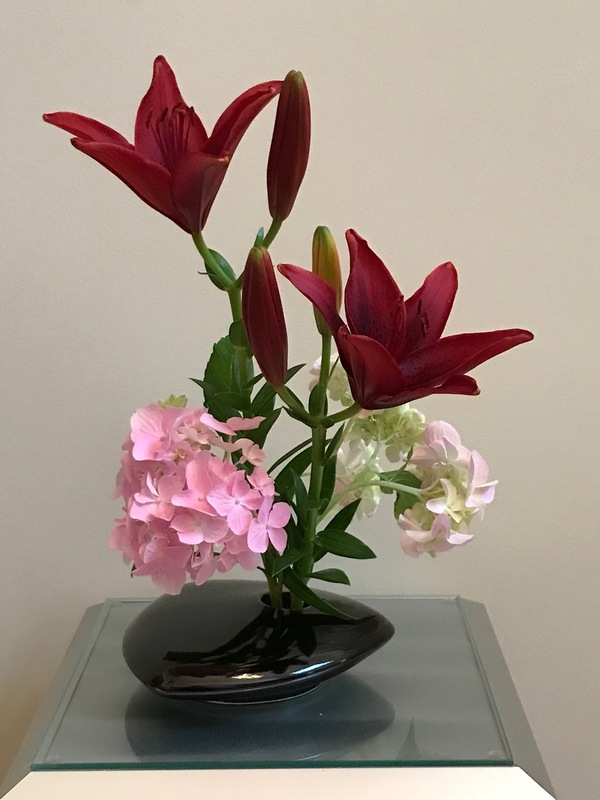 Using that Ikebana type vase always seems to result in the most dramatic arrangements. My lilies are up and budded (and caged to keep the rabbits away) but no flowers yet. I have a deep reddish black one but it seems to be the only lily I am not seeing in the garden which is a disappointment. Definitely a good move to remove the Echinacea. Oh, I do hope your reddish black lily will turn up. I’ve lost a lot of plants from the harsh winter, yet some things seem rejuvenated. I love the modern feel of this arrangement. And the vase is so different. 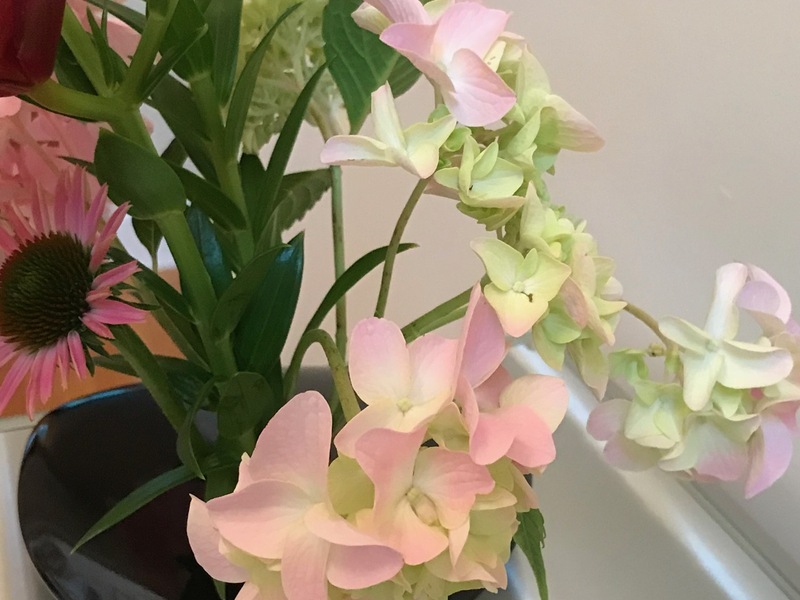 How do the flowers stay put? Does it have something like a frog inside? Thanks Magnolia. Yes, it has a self-contained frog which makes it so easy to just insert a few stems and you’re done. 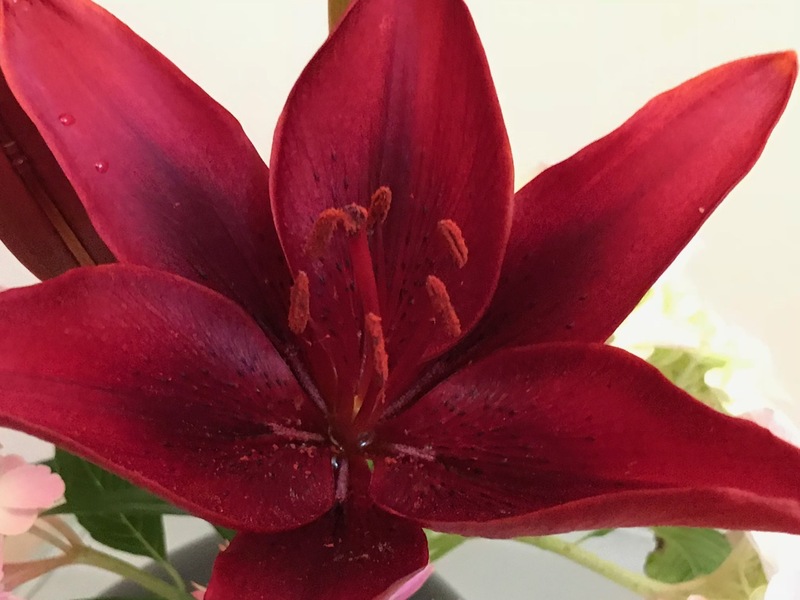 Oh my what an incredible deep red color that lily has….and it is stunning against the softer pinks. 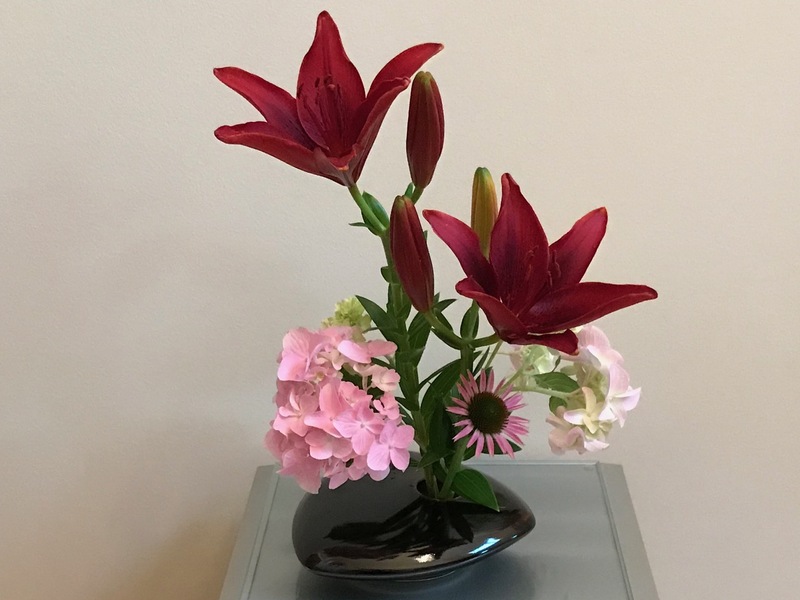 A deeply beautiful and quite peaceful feeling vase! Thanks Donna. The color of that lily is even better in person. (Of course, I love red flowers). You put so much thought into your arrangements and they always look stunning. This one is no exception – simple, elegant, beautiful. I appreciate your kind words Peter. 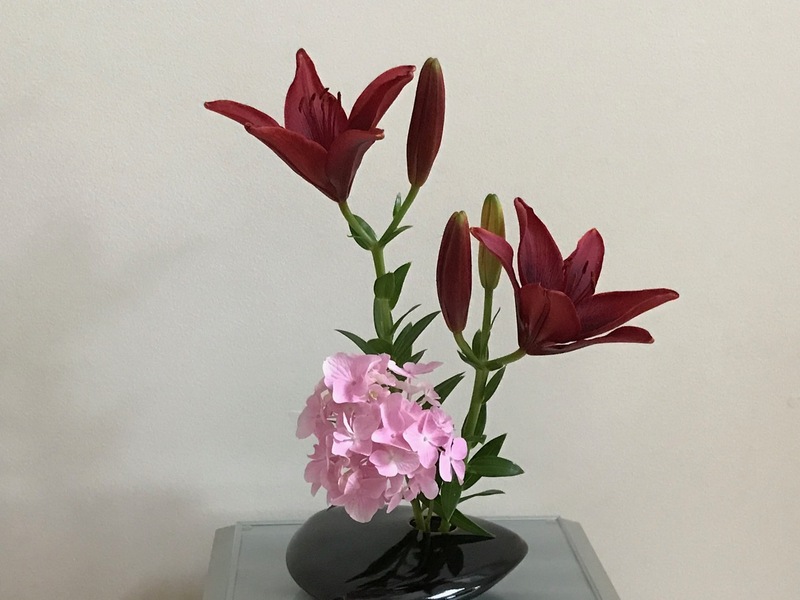 The lilies have definitely been great to have in the house where I can enjoy them. The design still feels a bit unsteady, but that’s what’s nice about doing the Monday vases–can try again next week. Beautifully balanced. Love the bright colours. Thanks Alison. If there’d been more time I probably would have fussed with it a bit more but I am enjoying the lilies. Such beauty with so few blooms, and so much pleasure it will give you – you can’t put a price on that, Susie. Thanks so much for sharing ps I think you were right to remove the echinacea! Thanks Cathy. Yes, I think the echinacea was so pretty in its fresh, youthful state, but it didn’t do a thing for the lilies! Lilies already! I’m drawn to dark flowers but find them much more difficult to manage (accent) in a vase than pastel flowers. Your pretty Hydrangeas make me wish I had some in my garden. FYI, I changed my blog setting to allow anonymous commentators so hopefully you won’t experience further problems there. Seems early to me to have lilies Kris, but the garden is barreling forward, barely pacing itself. Some day I’m planning to do a pose showing all the hydrangeas that have not survived in my garden. It’s a long list. (Thanks for changing your parameters for comments. Hope it won’t cause trouble. As much as I enjoyed growing cut flowers, I would not have done well arranging them. I never would have thought of putting these flowers together. A lot of my combinations are simply dictated by what’s blooming. I neither would have thought of combining them but that’s just what I had to work with. That is a beautiful lily – such a deep rich colour and the centre too. You have definitely done it justice, letting it rise up above the hydrangeas. Lovely arrangement! Thanks Cathy. The lilies seemed to demand to be the focal point this week. What a stunning lily, love that deep, rich color! It is a good strong red, isn’t it–very pleasing. Love the design and I agree with the edit. The lily buds add so much, do you think there are six elements? Not sure how you mean six elements. I actually wanted to trim a couple of buds out of the way but would not give up the future flowers. Sorry, actually I see seven – two Lilies, three buds and two Hydrangeas. Not sure if you have been drilled about odd numbers and landscape design. Ha. 2 each. Buds don’t count? I hadn’t noticed the dark pollen until I read a few comments. Very nice! I think the echinacea was just too round a form. Although the arrangement was beautiful before I think it it was even better without. Thanks for your thoughts on this. I think you’re right about the shape of the echinacea. 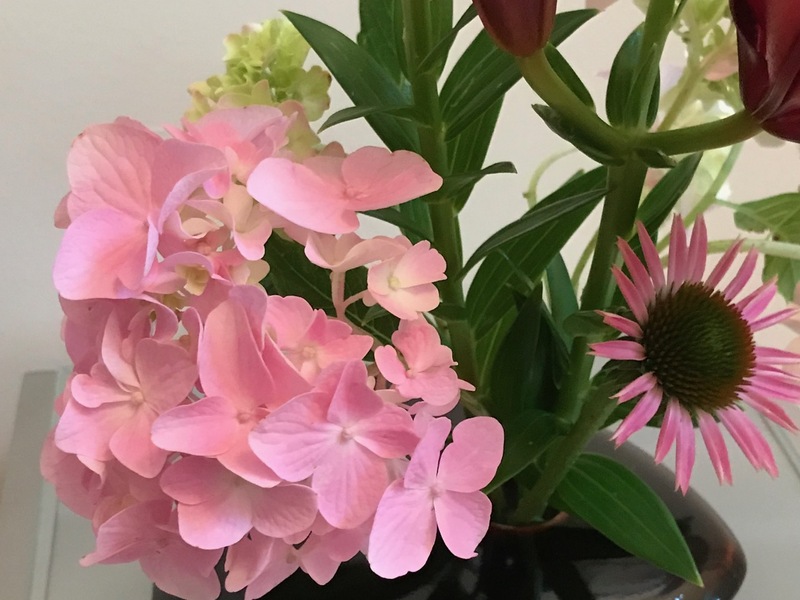 When arranging flowers I think we constantly are re-evaluating during the entire process and shouldn’t be afraid to take something out or move something around. Same with our gardens. And a beautiful Lily it is! I love that deep red. Thanks. It’s a rich, strong red alright. 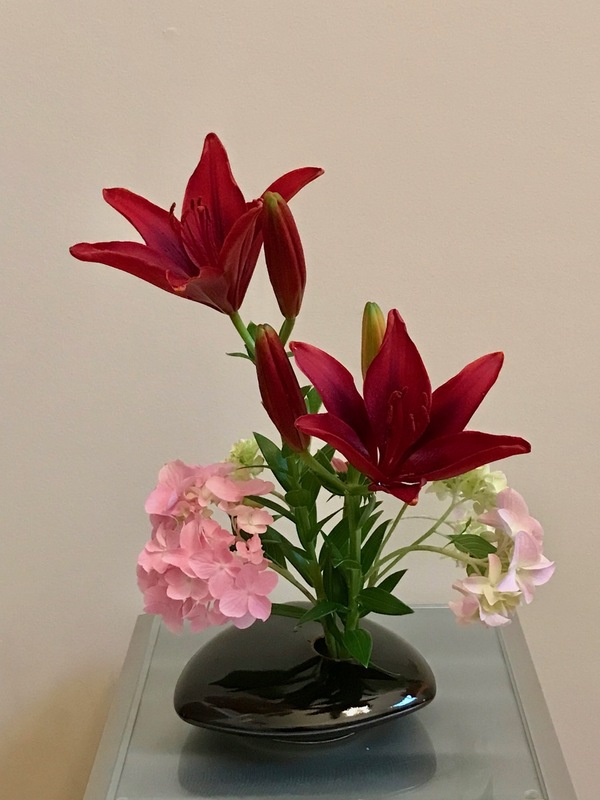 That is a stunning Lily, and the vase sets it off perfectly! Very nice! Thanks Beth. I’m enjoying that nice red.